Following a verbal dispute in Brooklyn Bridge Park, 11-year-old Zachary Cowan armed with carrying a stick strikes another 11-year-old boy, Ethan Longstreet in the face*. As responsible and involved parents who see the larger picture, the Longstreets invite the Cowans to their apartment to discuss the fight between the boys. Both sets of parents try to discuss the issue in a civilised manner for the benefit of their children. The Cowans get to the door and thank their hosts who invite them back again for coffee. You know they shouldn’t go back but they do… These are the first five minutes of Roman Polanski’s brilliant black comedy, Carnage, based on a play, God of Carnage by Yasmina Reza. Carnage is nothing but pure display of acting, writing and directorial prowess. Adapted for screen by Reza and Polanski, the film peels away the layers of civility and etiquette that the four characters display in the first five minutes. Penelope (Jodie Foster) and Michael Longstreet (John C. Reilly) appear happy and perfectly average couple who love each other and take extra interest in their children’s education. Michael has a hardware business and Penelope is a writer who is working a book on Darfur. On the other hand, the Cowans – Nancy (Kate Winslet), a real estate agent and Alan (Cristoph Waltz), a lawyer seem financially more successful but with a strained relationship. Over the next 74-minutes the polite conversation turns venomous and they all display some shocking behaviour. The four leading actors deliver stellar performance that is expected of artistes of their calibre. Cristoph Waltz however shines as a workaholic and rude man, whose phone keeps buzzing, annoying not only the other three on-screen but the audience that’s watching as well. Kate Winslet brings out maniacal energy on screen and shocks the most with her actions. The other characters who only appear as phone voices also add a lot of flavour, including Michael’s ailing mother and Alan’s work associate, Walter. Then there is a bottle of whisky, a bunch of yellow tulips, some art books, an apple & pear cobbler, a hamster and a hair dryer. 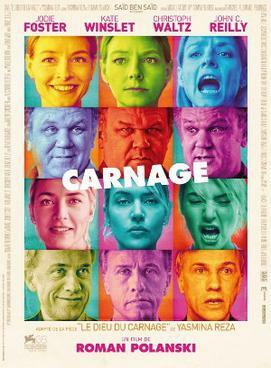 Carnage is an excellent film that shows how superficial and fake people tend to become with not only strangers but also their loved ones. As the film’s tagline says, it is ‘a comedy of no manners’ that spells utter mayhem, chaos and massacre in a brilliant cinematic way. *The first line in this post is almost similar to the film’s opening lines.